The building was used by Lakewood on Broad, (originally Lakewood Family Practice), headed by Dr. Curt Eshelman (of Durham Central Park) from around 1993 until Dr. Eshelmen retired and sold the practice circa 2000. Lakewood was previously located in the Gray House at Erwin Mills, and before that, it's original location within, what I believe was the old Century 21 office in the 1800(?) block of Chapel Hill Road. Gary, while researching this, did you see anything to indicate whether this was Durham's first TB sanitarium or who owned the land prior to Durham acquired it? While going through pre-1950death certificates for the piedmont counties, I was stunned at how many showed TB as cause of death. Those are the first interior shots I've ever seen. Nice work finding those. The rock hole, yes, I vaguely remember that now that it's been mentioned. Just happened by this blog; the comment about UNC's sanitarium got my attention and I did some checking. The description made me think it was the Clinical Cancer Center building close to the main complex (across the driveway from Women's and Children's Hospitals.) However, a document about the then-proposed construction of the new cancer hospital indicates it's actually the Lineberger Center (a.k.a. Gravely Building,) a domed brick building on West Dr. I've no idea of future plans for that structure, though. The Gravely Building on the UNC medical campus is located on Manning Drive, and is a brick structure situated in front of the N.C. Women's and Children's Hospital entrances. Funds for the construction of the Gravely Building were appropriated by the General Assembly in 1949 and construction was completed in 1953. 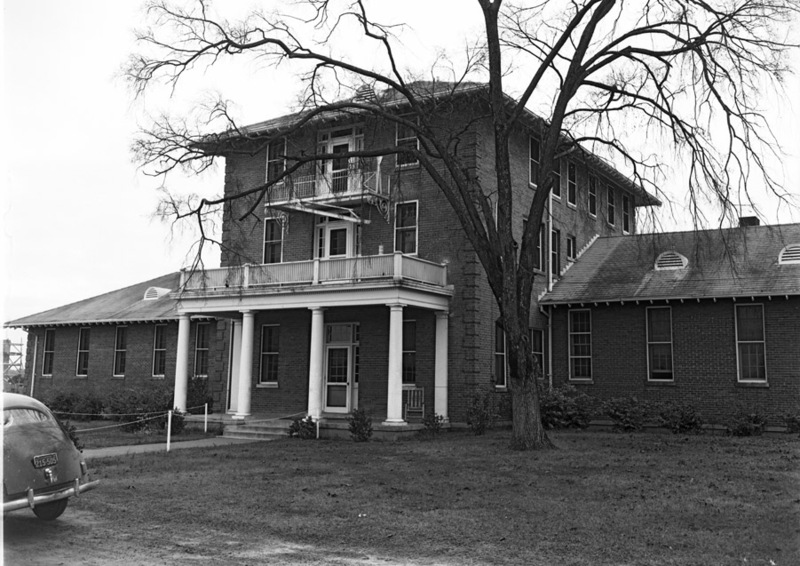 Gravely was a TB sanatorium until 1975. It is now more commonly known as the N.C. Clinical Cancer Center. As all oncology services will be moving this summer and fall into the new N.C. Cancer Hospital (also on the UNC medical campus), I believe the Gravely Building is scheduled for demolition, as it has been deemed unfit to accommodate the technology required for 21st century healthcare delivery. The Lineberger Comprehensive Cancer Center is indeed located on West Drive and will remain in use for administration and research, as far as I know. I can't remember exactly but I believe in the early '90s the Durham Jaycees hosted their haunted house in this building, and I went a couple of times. It was fantastic. The building was very eerie at night and the way they had the haunted house set up there couldn't have been scarier. I was born in 1978 and don't remember seeing any WTVD signage, but definitely remember a WLFL-TV 22 sign on a post out front, well after WLFL left the facility for 1205 Front Street in Raleigh (now home to WNCN-TV; WLFL and Durham-licensed WRDC are now at 3012 Highwoods Blvd, Raleigh). I don't think WLFL stayed in the building for very long, judging by news accounts from the stations 1981 sign-on. There was also a 150-200' studio-transmitter microwave tower out back (which dated to the WTVD days) which was taken down in 1990 when they renovated the facility as physicians offices. I still have a sheared-off bolt from the tower (complete with aviation orange paint) and the tower base is still there behind the building. I remember going there in the mid 1950s on saturday nights to watch jim thornton`s live country music show that was broadcasted on WTVD. I worked in the building as an engineer for WLFL TV22. We had quite a time attempting to reuse much of the old cabling left by WTVD. I was even able to get the old abandoned microwave equipment going to link us to the transmitter site in Apex. During WTVD's occupancy, my father worked to build the set of the Peggy Mann Show kitchen and installed the appliances. Later he joined me in his retirement to work on WLFL in that same building. I remember working in the building when it was WTVD from 1956 - 1959 when all TV was black & white and either live or on film. One of our top local live programs was "Saturday Night Country Style" with Jim Thornton. (From "Broadslab, North Carolina", he used to say.) He had some of the biggest stars in country music on as guests. 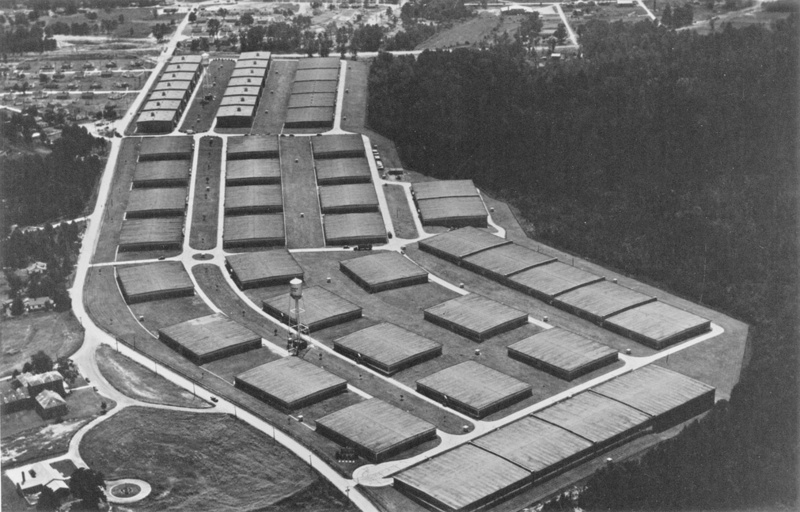 The tobacco smell from all the nearby warehouses was very prominent on warm, damp days. WTVD. Durham's TV station that wishes it was in Raleigh, and if someone outside the area watches they would think it was. The building looks better today than it ever has. I've always liked it's frontal symmetry. It was used as a haunted house at least once during Halloween. That was the last time I was in the building and I was allowed to walk thru the old parts I once worked in. Thanks for the information about the Rock Hole. I will add it to my map of the spring sites of Durham and try to take a look, if possible, see if the spring is still active. I am interested in any information of this nature. 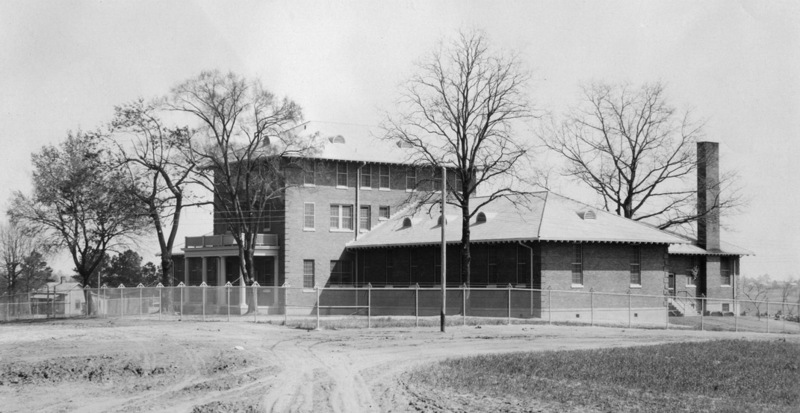 Durham County Jail, late 1920s. Perhaps no building in Durham has been more adaptively re-used than the former Durham County Jail on Broad St. I have yet to fully understand what prisoners were housed on the third floor of the Durham County Courthouse versus the jail on South Church St. versus the County Home in the early 20th century. Regardless, in 1925, Durham County built a new jail to house - at least the majority of - prisoners that had formerly been housed at the County Home/Prison Farm. The new prison was built to the west of the County Home property - I do not know whether the two properties were contiguous or not at that time, but I suspect that they were. Broad Street connected the jail with the city of Durham. However, the building was only used as a jail for 5 years - a new prison camp was built on Guess Road in 1930, and the building was no longer used / vacant. In the 1930s, Liggett and Myers built a large warehouse complex on the western side of Broad Street, across from the former jail. Aerial view, looking south. The former county jail is the building in the left foreground with a semi-circular driveway. 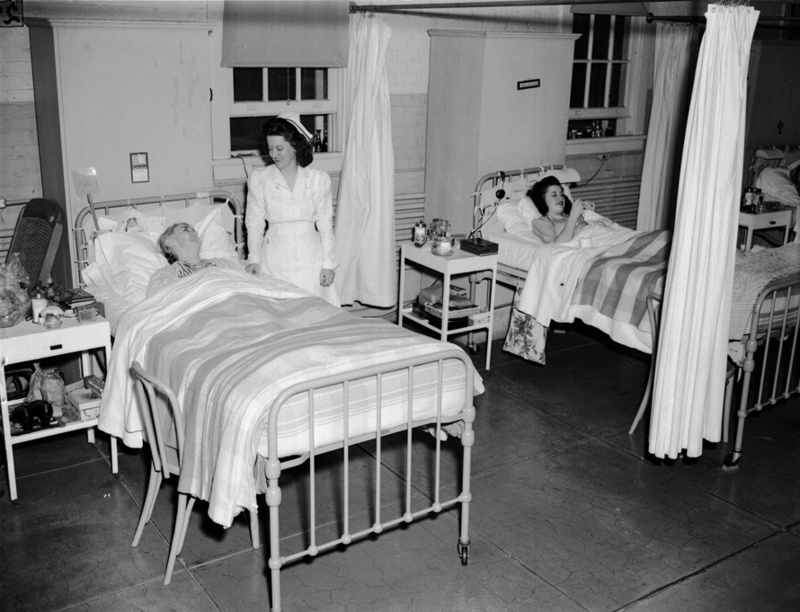 In 1943, the building was repurposed as a Tuberculosis Sanitarium. 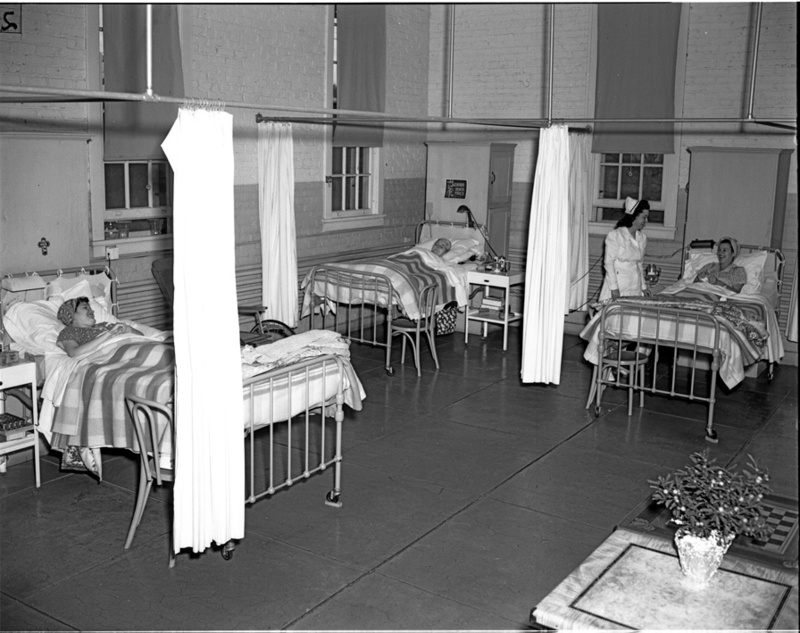 In the mid-20th century, specialized tuberculosis hospitals were common, where patients would convalesce over an extended period of time - essentially isolated with the hope that their immune systems would be able to successfully fight off the tuberculosis infection. After falling into disuse once again, the building became the new studios for Durham's WTVD television station in 1950. Former Jail as WTVD TV station, 1956. Fields behind the building, 1956. WTVD was housed here until 1977, when it moved to a former residential area east of downtown that had been demolished by urban renewal in the late 1960s. They built a new studio at Liberty and N. Dillard Sts. which took up that entire block. The former jail/sanitarium building was subsequently owned by the Family Television Corporation, and I assume it continued to be used as a studio. It subsequently returned to a medical use, renovated to house a primary care practice. I believe that it currently houses a Duke Family Practice clinic and DTW architects.